Its summer time, so we must all be in training for the Liz McDonnell 5k run which will be held this year on the 3rd October. The race starts at 3pm and registration will be possible on the day from 1 O'clock. Last year saw nearly 800 runners, joggers and walkers of all ages, complete the 5k course around the beautiful grounds of Castletown House in Celbridge, Co. Kildare. Entry to the event will be by donation or by sponsorship card. To get a sponsorship card or to find out any more information contact lizmcdonnellrun@eircom.net. To find out more about the Liz, the run and where the money goes click here or to see a copy of the course map click here. Erica was competing in the U18 girls javelin, competition started at 10.00am and she was the second girl to throw. With a foot fault to open Erica was feeling very nervous, thankfully she got her second throw in. Something must have been in the air as Erica and all her fellow competitors were not throwing as well as would have been expected. Erica won the competition with a throw of 27.63m - All-Ireland Champion. Congratulations also go to our master men who competed in the addidas race series on Saturday 18th July; John O'Regan M35 finished 19th in his category with a time of 30.38 and Tony Brennan M40 was hot on his heels in a time of 30.55 and was 20th in his category. Well done to you both and long may the friendly rivalry continue. I false started at the start of the race so I was pretty nervous when we were called to the line the second time. Fourtunately I calmed myself down and got a realy good start. We were even with Galway when I passed over but as soon as Aileen began running down the back straight it was clear that we were in the lead, which was great. Myself and Aileens pass-over went perfectly and all the other pass overs seemed to go well. Shannyn and Sinead continued to increase the lead throught the rest of the race and I got to watch Sinead running away with the title on the last leg. We finished about 15meters ahead in a time of 52.41, Galway 2nd- 54.31, Kerry 3rd- 55.22. It was everyone on the teams first gold all-ireland medal, Sinead, Aileen and Shannyn had won bronze medals in the past but never a gold medal. So we were all thrilled with the win. The team was (in order of running) Julie Boyle (le Cheile), Aileen Kyne (Newbridge), Shannyn Brogan(Newbridge) and Sinead Lawlor(Celbridge). Congratulations Julie on your part in Kildare winning the All-Ireland Inter County U17 Title. On Saturday 11th July Niamh Kane, Sean Flanagan and Julie Boyle represented Le Cheile at the National Championships. 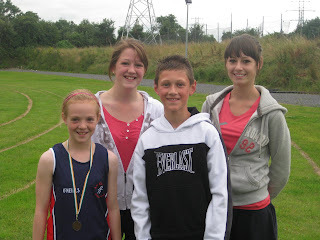 It was both Sean and Niamh's first track & field National Championships. 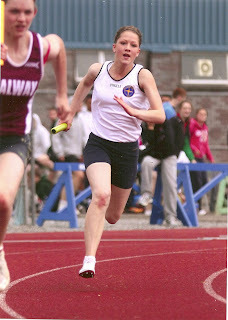 Julie was racing first – her 80m hurdles were listed for 10.00am. Julie was is the second heat and her reaction time to the gun was fantastic. Julie hit the hurdles well and finished 5th in her heat in a time of 14.23, unfortunately it was not enough to take her through to the final. Despite being disappointed Julie looked at the positives in her race - her reaction time and it was a seasons best. Well done Julie and thanks for hot –footing it back to fundraise in Tesco. We all got soaked in a heavy rain shower while waiting for the sprints to start. They got under way after 2.40pm. Niamh was in the 2nd heat of the U12 60m sprint and got off to a good start and she hit maximum speed in a very exciting finish. Niamh's time was 8.77, Niamh was cheered on by her mum Lorraine, the Flanagan gang and myself. Naimh was 3rd in her heat and qualified for the final. Niamh was sent to the stand to try keep warm and dry while she waited on her final. Next up was Sean Flanagan U13 80m sprint, again Sean was in the second heat, he was held in the rain while the starter got sorted, we could see Sean jumping up and down trying to keep warm before being called to get into his start psoition. Sean ran a terrific heat a time of 11.17 and it was a fight for the line in a blanket finish, thankfully Sean was third the 4th guys time was 11.18 so nothing between them. Sean was very wet but happy with his performance. At last the finals got under way,Niamh had a terrific race ran a time of 8.63, but had to wait for the result as officials had to look a footage as it was tight at the finish, the girls had to stay in their lane, finally Niamh was award 3rd and a Bronze All-Ireland Medal. Congratulations and well done on your achievement. All-Ireland medals are hard to win. Next up was Sean, he got off to a flying start and maintained his speed to the end in a race that was very fast and one that a new championship record was set. Unfortunately Sean was out of the medals but he could have not have done any more, he finished in 6th place in a time of 11.10 which was faster than his heat, so well done Sean you kept something in the tank for the final. On Sunday 12th Sean was back down in Tullamore along with his family, he was competing in the U13 boys long jump, Sean jumped his 3 jumps and made it to the final, Sean had three more jumps and did his best, he was outside of the medals and finish 8th overall with a jump of 4.25m. Well done on your performance Sean, it didn't go your way on the day. Next round of the All-Irelands are this coming weekend and the club will be represented by Julie Boyle who is on the inter-county relay 4x100 team and Erica Dixon U18 who will compete in the Javelin. Best of luck to you both. The following Le Cheile Athletes will compete in the All-Ireland Championships this weekend. Best of luck to you from all the Coaches and your fellow athletes. Our very own John O’Regan is at it again, with another fundraiser for the Jack & Jill foundation, he will lead a team that will run a Mobile Marathon Relay from Galway to Dublin on 7th, 8th, and 9th August 2009. People can find out more about the Jack & Jill Mobile Marathon and how they can join in by logging onto http://www.jackandjill.ie/ The Jack & Jill Foundation supports 300 families around the country with children who are born with or who develop brain damage and who suffer severe neurological delay and need intensive home nursing care as a result. 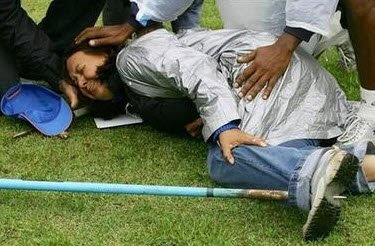 Given that we have a number of junior athletes who have started throwing Javelin lately, in case there is any doubt as to how dangerous it can be......as a picture paints a thousand words.